The Hamlet of Mile-End Old Town was the subject of a report in An Account of Several Workhouses..., dated June 1729. A Strong Brick Building near Stepney Church, (formerly a Musick-House of no good Repute, and for that Reason suppress'd by the Magistrates) was fitted up and opened at Lady-Day 1725, for receiving the Poor of this Hamlet ; and there are now in it 31 Men, Women, and Children, who are all employed at picking Ockam, under the Care of a poor Man and his Wife, who are allowed 5 s. per Week, with their Lodging and Maintenance in the House. THE whole is governed by six Trustees, one of which is the Church-Warden of the Hamlet : Each of them have the Charge of the House for a Month, to buy Provisions, visit the House, &c.
THEY have Flesh three Times a Week: Their Breakfasts and Suppers are Milk and Bread, Cheese and Butter. THE Charity-School for 21 Boys and 10 Girls is in the lower Part of the House, and the Mistress of the Girls is allowed an Apartment and Maintenance in the House ; and such of the Children as are Parish Orphans, are set to Work, as well as taught to read and write. 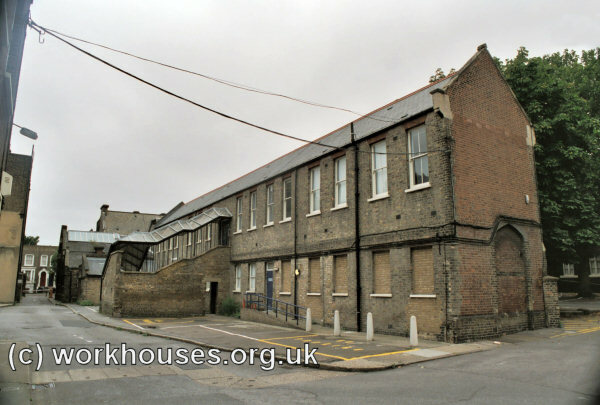 According to Cleminson (1983), a new workhouse was set up at Mile End Old Town in 1803 following local protests about the local Parish Committee's misuse of the Poor Rate. A house was leased for the purpose from a Revd. Thirwell. By 1828, 284 inmates occupied the then hopelessly overcrowded premises. Mile End Old Town workhouse site, c.1830. In 1836, Mile End Old Town parish became part of Stepney Poor Law Union. In the 1840s, the former Mile End Old Town parish workhouse in Alderney Place was used by the Stepney Board of Guardians to accommodate able-bodied men and fever patients. In 1857, Mile End Old Town became a separate Poor Law 'Hamlet'. 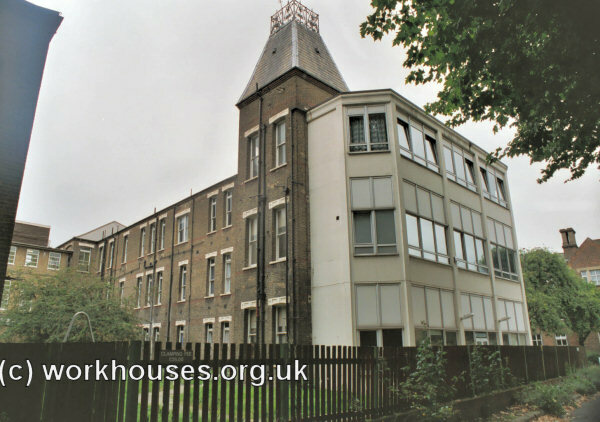 A new workhouse, for 500 adults inmates, was built in 1858-9 on a seven-acre site to the north of Mile End Road adjacent to the Jews' burial ground. A new road, Bancroft Road, was created to provide access to the workhouse. The first stone of the new workhouse was officially laid in August 1858 by Chairman of the Guardians, Spencer Charrington Esquire. The building was designed by William Dobson in a plain Domestic Tudor style and constructed Messrs. Ayers of Dover at a cost of £20,258. The location and original layout of the site are shown on the 1876 map below. Mile End Old Town workhouse site, 1876. 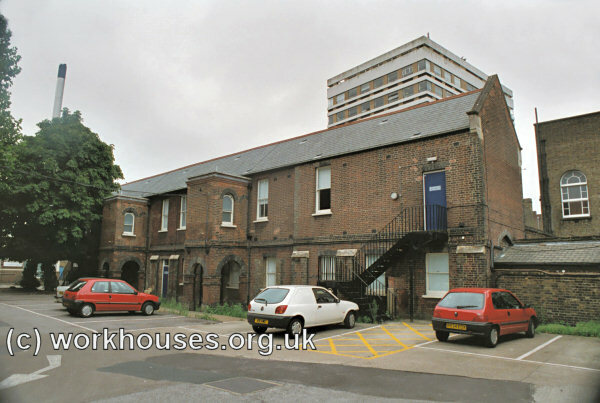 Mile End Old Town entrance block from the west, 2001. Mile End Old Town main block from the west, c.1908. Mile End Old Town main block from the west, 2001. Mile End Old Town rear of main block from the north-east, 2001. Mile End Old Town casual ward block from the west, 2001. Mile End Old Town casual ward block from the east, 2001. In 1881-3, a new larger infirmary was built on the site of the old infirmary and imbecile wards. It comprised three parallel three-storey blocks with administration and services at the centre flanked by male and female ward pavilions as shown on the 1894 map below. 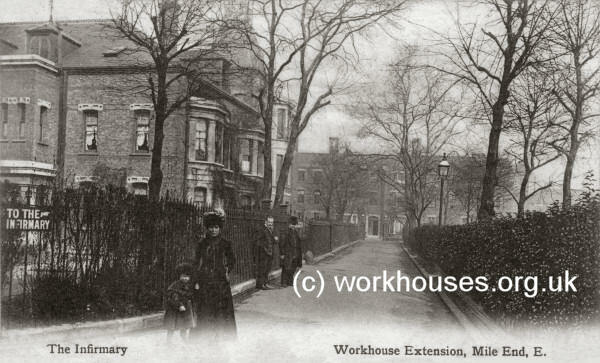 Mile End Old Town workhouse site, 1894. 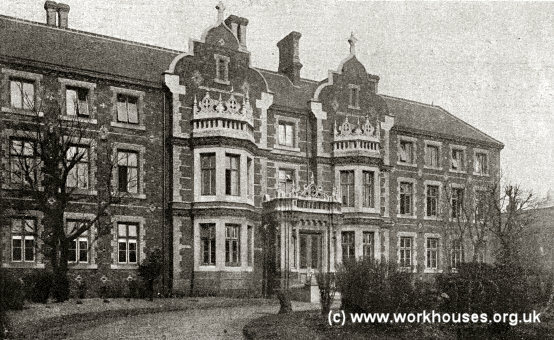 Various other additions and alterations took place including the conversion of the school block to a nurses' home in 1910. Mile End Old Town new infirmary and former children's block, c.1910. From 1904, to protect them from disadvantage in later life, the birth certificates for those born in the workhouse gave its address just as The Lodge, Bancroft Road. 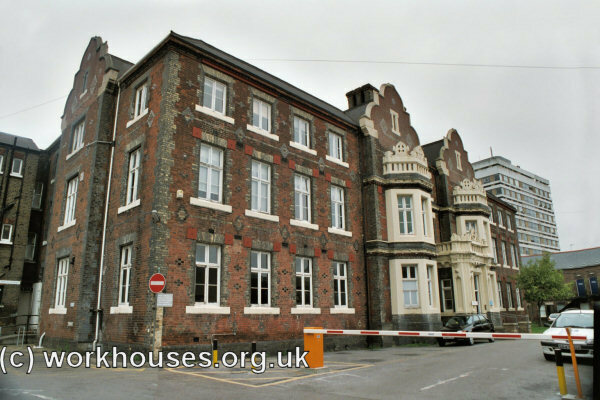 In 1907, the workhouse became embroiled in a scandal relating to excessive payments made by the Board of Guardians to local tradesmen and contractors, notably a coal dealer named Joseph Cade and a builder named James Calcutt. After being convicted of fraud, Calcutt claimed that a number of Board members had accepted bribes from him in return for giving him contracts and for paying inflated bills submitted by him. Ten members and ex-members of the Board (Joseph Gilson, Samuel Gilder, Thomas Gould, Rowland Hirst, John Edward Kemp, Jonathan Edward Loftus, Archibald Walter Ridpath, James Frederick Stammers, Walter Trott, John George Warren) then stood trial for having conspired with Calcutt to defraud the Board. 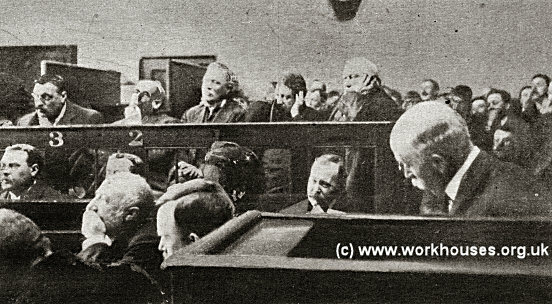 On August 7th 1908, after a lengthy trial, all were found guilty of conspiracy and of corruptly receiving gifts. All received a sentence of a fine and imprisonment with hard labour, except for Gilson who received just a fine. Hirst, a former mayor of Stepney, and in whose public house much of the bribery took place, received the severest sentence of a £250 fine and two years imprisonment with hard labour. Mile End Old Town Guardians in the Dock, 1908. 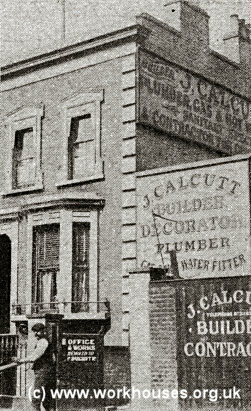 James Calcutt's house and business premises. 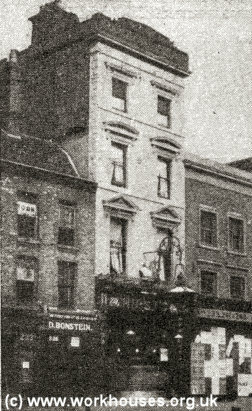 The 'Three Crowns' public house kept by Alderman Hirst. In 1925, Mile End Old Town became part of an enlarged Stepney Union. In 1930, the Mile End site was taken over by London County Council and became Mile End Hospital. More recently it operated as Mile End Accident and Emergency Hospital, and then as Mile End Hospital. 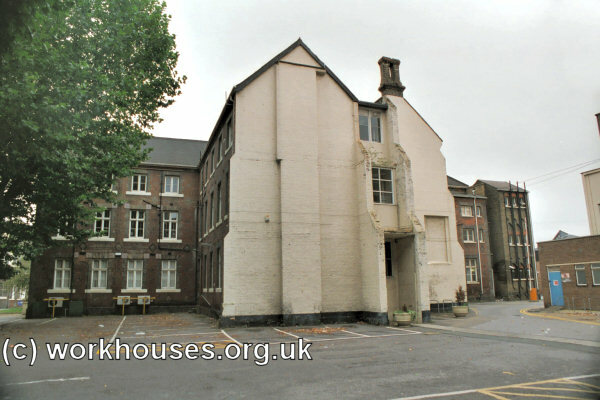 Most of the workhouse buildings have now been demolished. By the early 1900s, the Guardians had begun to operate a number of children's scattered homes. 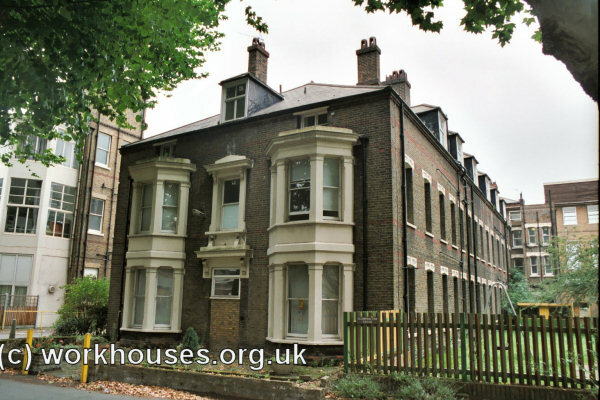 The locations included: 14-17 Cottage Grove, Coborn Road, and Bow Road, all within five minutes walk of the workhouse. In 1924, the eleven homes then in operation could accommodate a total of 159 children. General Records — Guardians' minute books (1857-1926); Financial records (1857-1925); Staff records (1880-1925); etc. Mile End Old Town Workhouse — Admissions and discharges (1840-57); Deaths (1854-7). 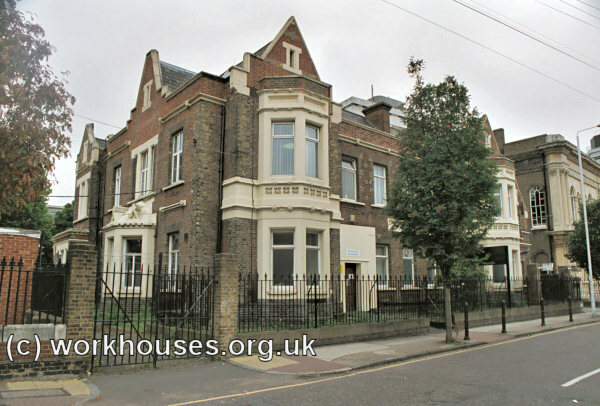 Bancroft Road Workhouse — Admissions and discharges (1879-1926); Creed registers (1877-1912). Beyond Recall: The Making of Mile End Hospital by F Cleminson (1983).